A few weeks ago my oldest niece and I had a long conversation about life’s challenges. My niece was going through a rough patch. Life can sometimes do that to teens, as it does for adults too. I reminded her that she is beautiful, talented, funny, kind, smart and so very loved. Among her talents, she is a growing artist. Her work is lovely, filled with her thoughts and emotions. She has a teacher who also sees her talent and taps it as great teachers do. Through her encouragement my niece submitted a drawing for consideration of a mural on a big blank wall in downtown Clawson. And it was chosen. The beauty of this story is it’s larger than my niece. It is a wonderful story of a businessman, teacher, students and city coming together to create art and make people smile. It is the type of story that can get lost in the news amidst the economy, politics, thugs and death (kudos to the few local papers that covered this). So it is a story that I proudly share. The story begins with a local businessman who is committed to and believes in my little childhood city, Clawson. Dan, the owner of Trim Barbershop and Tease Salon, takes pride in his businesses and the city. He wanted to spruce up the parking lot area where most customers walk through to enter the stores in the strip. The outside wall of Tease was big, and oh so plain. He approached the high school art teacher with an idea. Working together, they recruited students to submit sketches and went to the city with an idea that was approved. The teacher is the type of educator that gives teaching a great name. I’d like to think we all had at least one – the teacher who noticed a special talent, nurtured and encouraged it. My third grade teacher, Mrs. McClure, acknowledged my love of reading and writing stories and never let me ignore it. With her encouragement I wrote my first short story in third grade. She typed the pages, I drew the horse pictures and then she urged me to read the book in front of my class. As a child I was painfully shy, hiding behind more outgoing friends and sisters. Writing was my outlet. My teacher knew how to give me confidence in my ability to write and helped grow my passion, which eventually became the basis of two college degrees and a professional career. Harley’s art teacher noticed her talent, encourages her and helps my niece trust in her ability to create art. Then there are the students. Talented with a wide open future ahead. 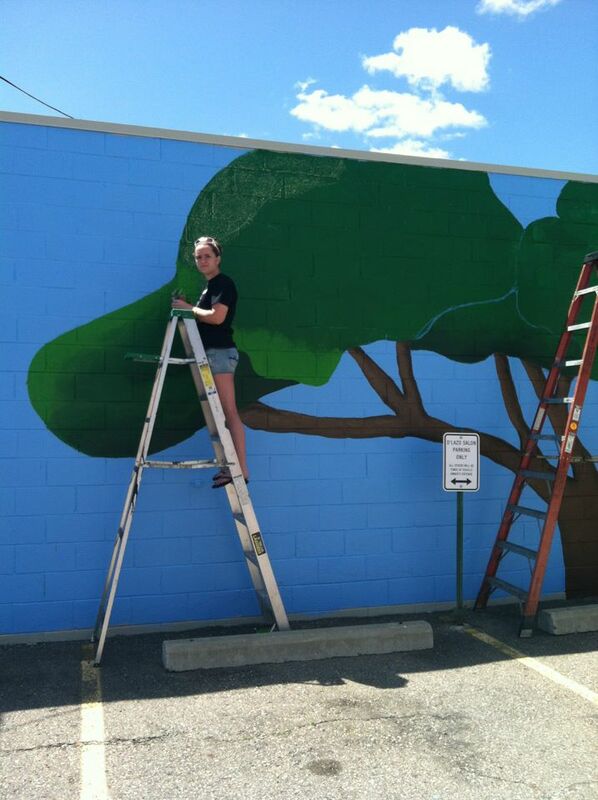 Several students submitted drawings for mural possibilities. My niece’s was chosen by the city council. Her fellow students used their skills and dedication to help make her vision a reality (her sister also helped at times, as families often do!). To add color and life to a blank wall. I am ridiculously proud of my niece, as I always am of all four nieces and nephew. They make me smile and believe that the future will be bright. She took a chance, believed in herself and shared her talent with her community. This is of course not just one teen’s accomplishment, but a team that came together. Which makes it that much prettier of a story to tell. 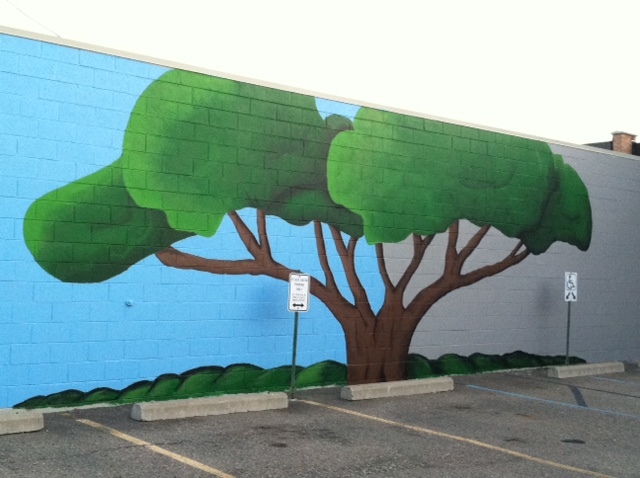 This mural is a painting that tells a story of a great collaboration between students, a teacher, business and city. Teamwork, dedication to each other and the community. A simple drawing with a big impact. thanks for sharing this, the love you share and nurture comnes through loud and clear, and the mural is more beautiful than the picture reflects, of course, done with love usually turns out that way.